Should I see the Sagrada Familia interior? 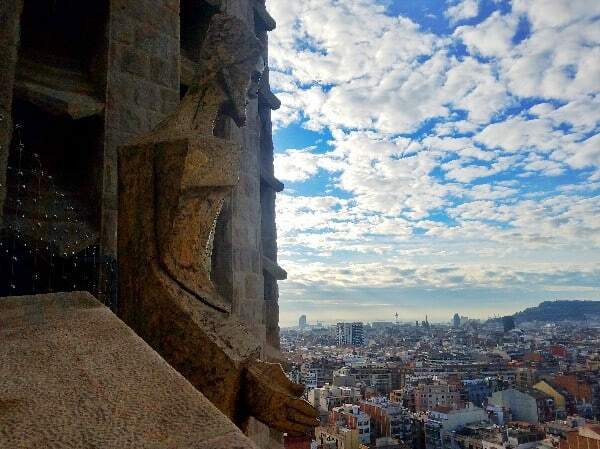 Is going up the Sagrada Familia towers worth it? Back in the day, it was easy to walk inside the Sagrada Familia church and buy your ticket. Today – no more. Now you have to snake through lines and get through airport-style security, equipped with security machines and metal detectors (but no pat downs, phew). In the summer, queues to buy your Sagrada Familia tickets wrap around the block. You can easily HATE the Sagrada Familia without stepping in the door yet. But that’s not going to happen to you, will it? 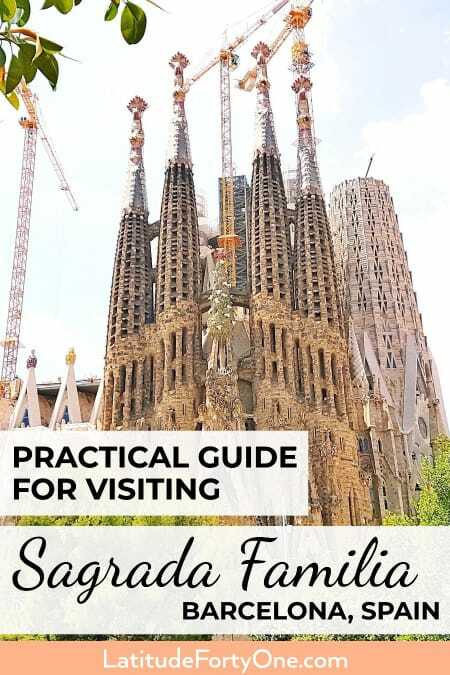 Because you’re armed with this ultra-practical guide for your Sagrada Familia visit. Allow me to unpack the whats, wheres, and hows: the best time to visit, how to buy tickets, which tower to go up, and other discombobulations eating your brain. 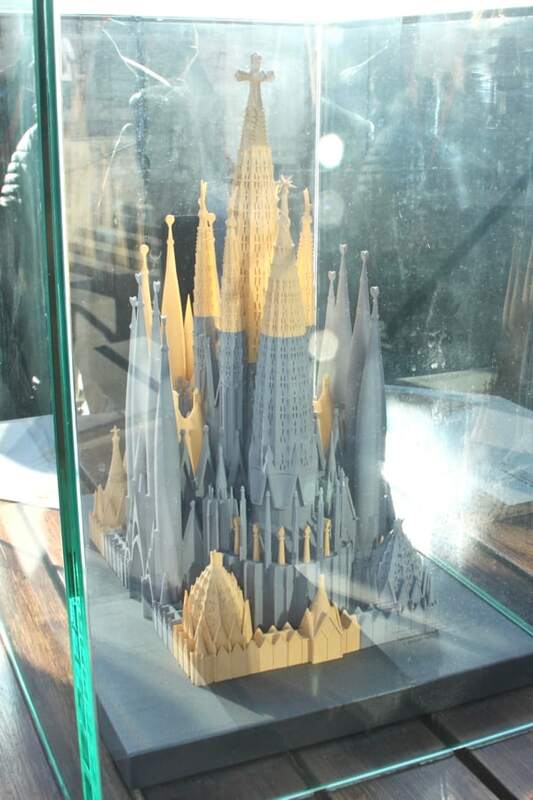 I visited Sagrada Familia in December, so I was surprised to see how much it’s changed. 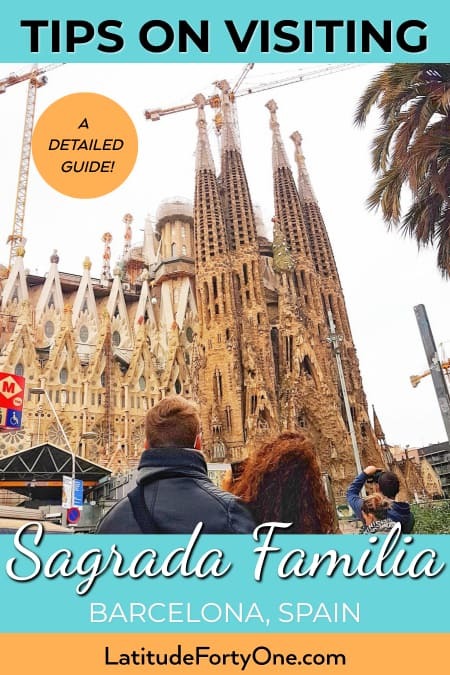 Read on to know everything you need to know about the Sagrada Familia: tips for your visit! The Sagrada Familia is designed by the famous Catalan architect, Antoni Gaudí. However, Francisco Paula del Villar was the original architect who resigned after a year into the project. His plans were to make it a Gothic revival church. Construction started in 1882. 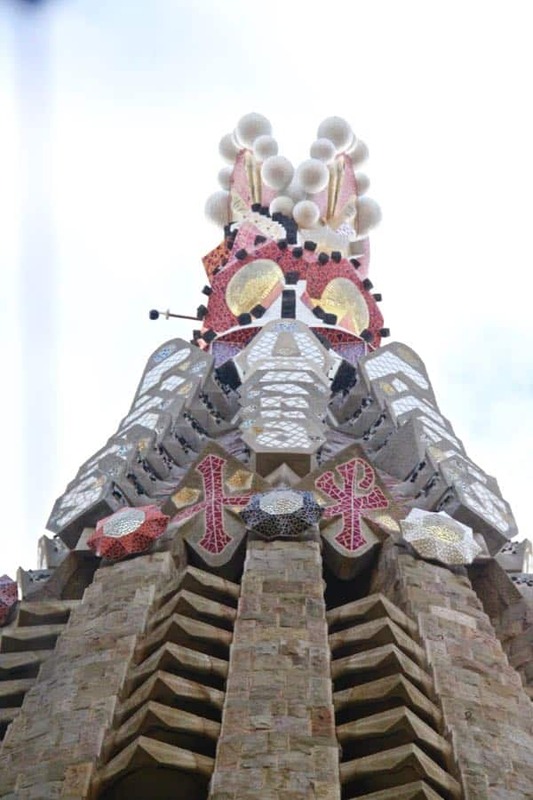 It’s expected to be completed in 2026, the centenary of Gaudi’s death. It’s taking decades and decades to build because it is privately funded as the government is NOT funding the church. It costs 25 million euros a year to build. Gaudí, who was an extremely devout Catholic, started the project when he was 30s. He knew that the church would not be finished in his lifetime, so he created plaster models for future engineers to follow. Sadly, he was run over by a tram in Barcelona in 1926. The architect is also buried inside the church, and a small organization is trying to canonize him a saint. How does Saint Antoni Gaudí sound? After Gaudí died, his plans were saved. But many were destroyed in a fire in the 1930s. Subsequent architects took over and recreated some their own designs, trying to stay true to Gaudí’s vision. The designs have been controversial as they say they deviate too much. But the show went on. This church is NOT called “Sagrada Familia Cathedral” but a basilica. A cathedral is a bureaucratic term. (In this case, the main cathedral of Barcelona is the Barcelona Cathedral in the Gothic Quarter.) A basilica is an architectural term. The full name of the Sagrada Familia is Basílica i Temple Expiatori de la Sagrada Família (Basilica and Expiatory Church of the Holy Family). Many historic folks hated the Sagrada Familia, like George Orwell and Pablo Picasso. 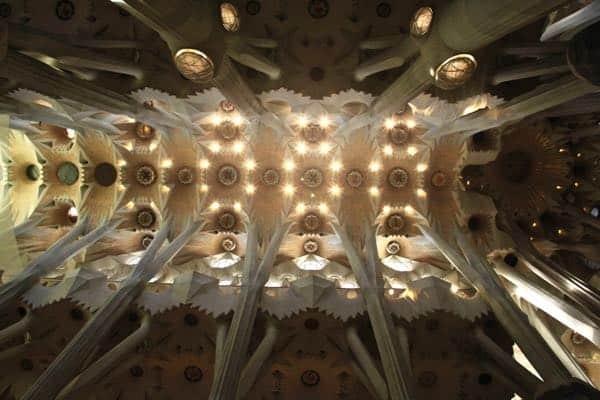 Antoni Gaudí believed that no man-made structure should surpass the height of what nature can produce. That’s why it will be 172 meters, one meter shorter than the Montjuic mountain in Barcelona. In the end, the basilica should have 18 spires and three facades: Nativity Facade (original by Gaudí), Passion Facade, and Glory Facade. As we speak, there are 8 spires and two facades: Nativity and Passion. Feel the magnitude. Your neck will seriously start hurting after awhile. The Sagrada Familia is one of Spain’s most prized cultural sites, like the Alhambra in Granada or the El Prado Museum in Madrid. The Nativity Facade and the Crypt are also UNESCO World Heritage Sites. La Sagrada Familia the most unique Roman Catholic church you’ll probably ever visit. It’s every aspect of Jesus’ life told within the structure of the church. For that, historians say Gaudí was decades beyond his time. Every architectural detail is symbolic and very intentional. For example, the interior mimics a heavenly forest of tall trees and branches, representing life. The 18 spires represent Mary, the Evangelists, the Apostles, and Jesus. The Nativity Towers represent the symbols of the bishops: the top is the headpiece, the trunk is the bishop’s staff, and the middle part is the bishop’s ring. There are hundreds of these puzzles and symbols that are fun to unpack. It also has a well-curated and highly informative museum inside, which is included in your ticket. You could spend a good hour here as learning about Sagrada Familia facts, timelines, studying plaster models, etc. You can also see the architects and engineers at work: brainstorming, cutting, whatever engineer-y things they do – all seen through a glass mirror. (Yeah, how fun is that – working like a highly functional lab rat?) I’ve got to hand it to the Sagrada Familia marketing team – the whole visitor experience makes you excited and feel like you’re part of it. You detest the Catholic Church. You hate culture. You hate art. Therefore your heart must be made of cold stone. Okay, seriously. Don’t go in if you don’t have time. Or if you just don’t care that much about churches. Or maybe if you’re on a very strict budget. The minimum basic ticket is 17€, so it’s not cheap. No judging. See it on the outside and move on. A mini Sagrada Familia of the future. Just 7 years left! From the Passion Tower, Sagrada Familia details up close. Towers of the Nativity Facade – The Nativity Facade is the only facade designed by Antoni Gaudí before his death. So if you go up, you can see the intricacies and details of his work. The towers have has a small bridge, which you can cross and get interesting views. You can also access the small balconies. It faces the north-east, so you can see the cityscape of Barcelona and the sea. The staircase going down is a little narrower than the Passion Facade. I talk more about the towers later and in the FAQ. Click here to skip below and experience going down the towers in my video. Learning how to buy tickets to Sagrada Familia can be overwhelming. First of all, there are different ticket outlets out there. 1) You can buy tickets to La Sagrada Familia through the official website, which is run by Clorian, 2) or you can go through a third-party vendor. Whichever way you choose, I highly recommend you buy your tickets ahead of time. They charge 3-4 euros more if you buy them at the door. PLUS, you have to wait in line – with the exception of winter. The people of the Sagrada Familia are begging you to buy your tickets ahead of time! You can buy them starting at two months in advance. Sagrada Familia Basic Ticket – Skip-the-line ticket. This is a ticket that allows you to go inside and explore on your own. You can ONLY visit after 2pm. This is an “okay” option as you don’t get the depth that you would with a tour guide or even an audioguide. 17€ for adults, 15€ for those under age 30. 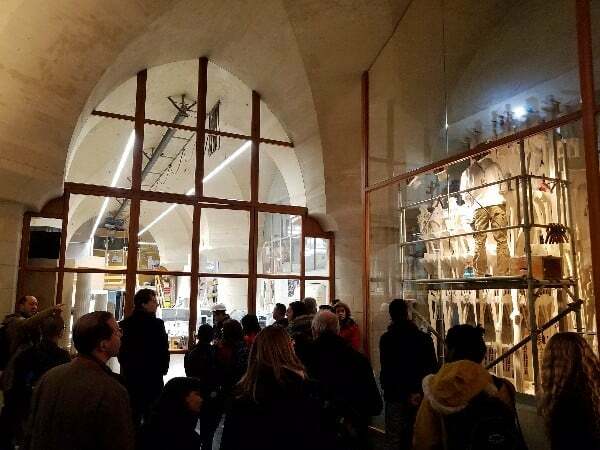 Sagrada Familia and Gaudí House Museum: Entry ticket, audioguide, and Gaudí House Museum, which is at Park Guell. If you buy the “Sagrada Familia with Towers” ticket, you choose two entry times: a time to get into the Sagrada Familia and it will automatically assign you a time to get into the towers 15 minutes after. This 15 minutes will give you enough time to go to pick up your audioguide and make your way to either set of towers. NOTE! You cannot choose which tower you want to go up. It depends on availability. 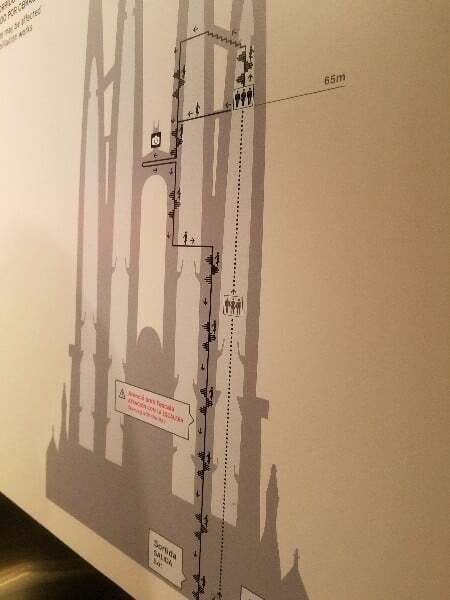 If you’re dead set on going up the Nativity Tower, the most economical way to do it is to buy from the Sagrada Familia website, where you can choose your towers. Also, read what you’re buying carefully. Be sure that you book for BOTH the tower and the guided tour. Sometimes it gives you the option for the tour without the tower access. 20% off Picasso Museum, Casa Batlló, La Pedrera (Casa Milà) and much, much more! The Barcelona City Pass with a guided tour is 89.50€ (plus 2.39 processing fee), and it’s one of the best Barcelona attractions deals for the number of attractions you get into. Let me save you time going from website to website. 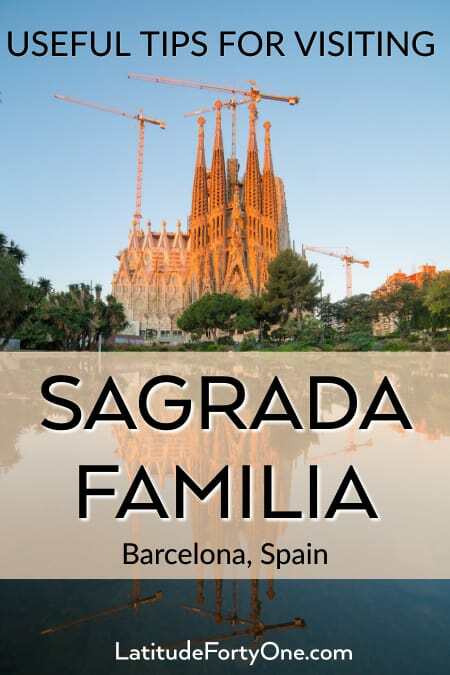 The cheapest way to see the Sagrada Familia is to purchase a basic ticket (no towers, no audioguides, no tour guides) is through the Sagrada Familia website. Is it the best way to see the Sagrada Familia? No, I don’t think so. Because you miss out on important symbols and facts throughout the church if no one points them out to you. The interior itself isn’t a museum (although it has one), so there are only a few short descriptions if you explore the Sagrada Familia basilica on your own. Tickets are 17€. If you’re under age 30, the tickets are 15€. If you buy this ticket, you can only visit after 2pm. As I mention, at a minimum, you should get the audioguide. It’s 45 minutes long. The cheapest way is to buy it through the Sagrada Familia website. It’s 25€ for adult, 23€ for those under 30 years old. Once you’ve booked your tickets, go to the Carrer Marina (Marina Street) side. This is where the general entrance is once you have your tickets. (If you’re buying your tickets on-site, the ticketing office is on the other side parallel to Carrer Marina on Carrer Sardenya.) The group entrance is on the left by the gift shop. Go on the right-hand side for general entrance. Once you walk inside, you’ll have to go through heavy security. Employees are there to guide you as if you were in LaGuardia Airport – yay! Your belongings go through a scanning machine, and you walk through a metal detector. Once you get through Security, you’ll step outside, and you’ll be on the side of the Nativity Facade. You’ll see a sign to pick up your audioguide to your right. Once inside, lines for the audioguide should go fairly quickly. 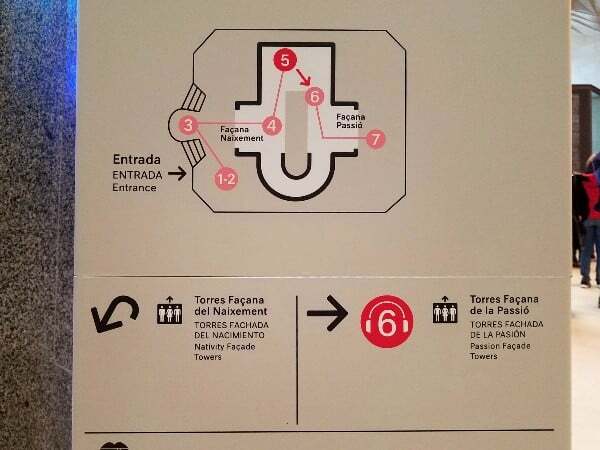 Next, it’s time to navigate your way around the Sagrada Familia. They will NOT give you a handy pamphlet about the Sagrada Familia to carry around – probably because it causes waste. So – no map, nothing. (Maybe it’s a way for them to get you to buy an audioguide?) Once you pick up your audioguide, use your own headphones or earphones because the audioguide has a jack! It also has a lanyard. So if you’re carrying lots of things, you can just throw it over your neck. 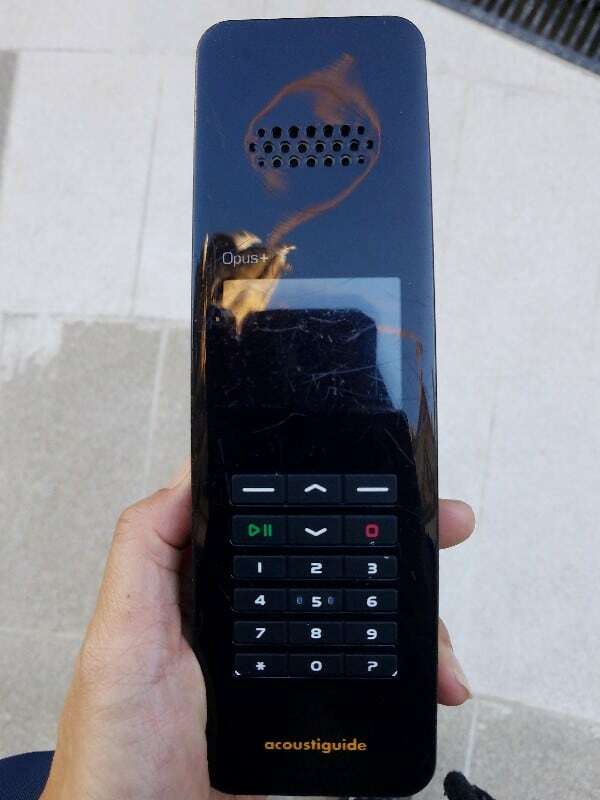 Then you’ll be hands-free. This helped me relax a little bit more! An informative audioguide. Bring your earphones! If you have tower tickets, head to your tower! See the map below. “Façana Naixement” is Nativity Facade, and “Façana Passió” is Passion Facade. You’ll go through the basilica to get to the Passion Facade. 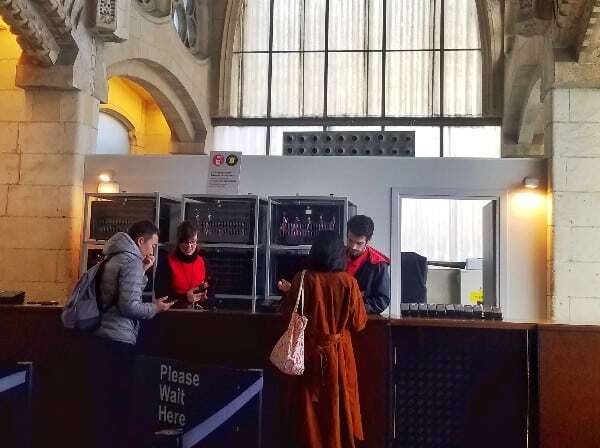 If you have tower tickets to the Passion towers, walk through the church. Note that the Sagrada Familia towers are not a place to hang out for long. It’s like 20-30 minutes – TOPS. You literally go up in an elevator, enjoy the views and take photos, then you head back down. There’s no dilly-dallying or sitting on benches or anything. The space up there is not that big. I spent about 25 minutes there and arrived at 9:30am. There were just a few people, so I didn’t have to fight for spots for photos. Overall, the experience was exciting and exhilarating – just like my other visits to the towers in the past! After your visit, you can stay inside the Sagrada Familia as long as you like. I spent about 3.5 hours there, and I could have easily wandered around for an hour more. But I had adulting responsibilities awaiting me at home. The audioguide is 45 minutes, so it’s best to follow it in order according to the map. It’s fun to compare the intricate and old designs of Gaudí with the new designs of the following architects. 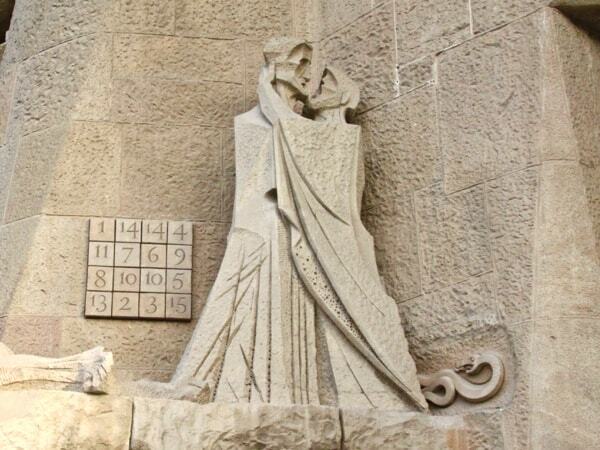 Math, symbolism, and puzzles are everywhere at the Sagrada Familia. As I mentioned, the Museum of the Sagrada Familia is fascinating. The people of the Sagrada Familia keep their construction plans like an open book! Tourists get to watch the workers create mini-models of the upcoming sections of the church. Is getting an audioguide worth it? Yes, most definitely. And getting an audioguide is the minimum you should do. There are a few descriptions that you can read throughout the Sagrada Familia grounds, but it’s not enough to fully appreciate it. If you can pay for a guided tour, I recommend that too. What’s the best way to see the Sagrada Familia? It’s a personal opinion. For me, it would be a guided visit AND a visit up the Nativity Towers. But you won’t find that combination anywhere. Not in a book. Not in a house. Not on a mouse. Trust me – because I tried. And if you challenge me on this one, let me know. As I’d love to update this blog post! For now, I think this is the best value. 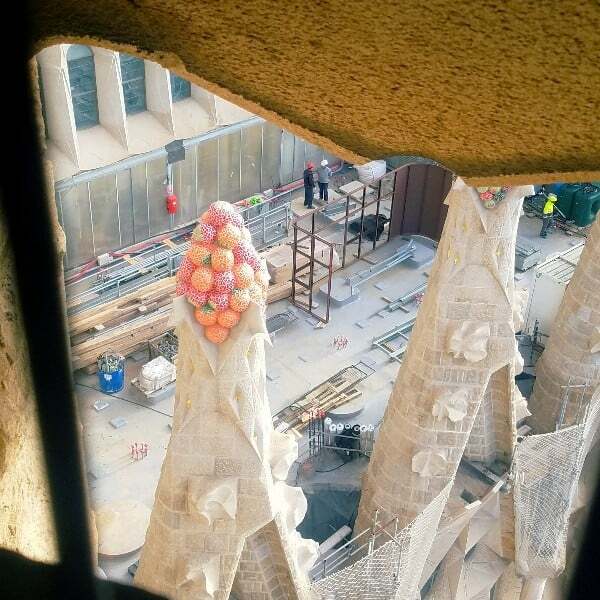 Is the Sagrada Familia staircase of the tower dangerous? I’ve gone down the staircase a few times. The last time was when I visited in December 2018. The thought of winding down the towers had me in the sweat the morning I was going to visit the Sagrada Familia. I thought, “What if I have a panic attack inside? How will they get me down if I break my leg?” But, honestly, it’s not like you can’t EVER use the elevator down in case you break your leg. If you feel like pausing, there are small spaces where you can retreat and let people behind you pass. I’ve never had a claustrophobic attack, so I don’t know what that’s like. But I can assure you that, once I was there, I was much calmer than I expected. If you have any doubts, take the Passion Facade towers vs the Nativity Towers because it’s newer and wider. The first 2/3rds don’t have an exposed hole down the middle, so you’re just concentrating on the steps. And the steps aren’t tiny or difficult to go down. Also, consider going in the morning when there are fewer people. A lady behind me asked to pass me because I was taking photos. She barely squeezed by. Like I said, every 30 steps or so, there are small “inlets” where you can tuck yourself in and let another person pass. So it’s not like you’re completely stuck! 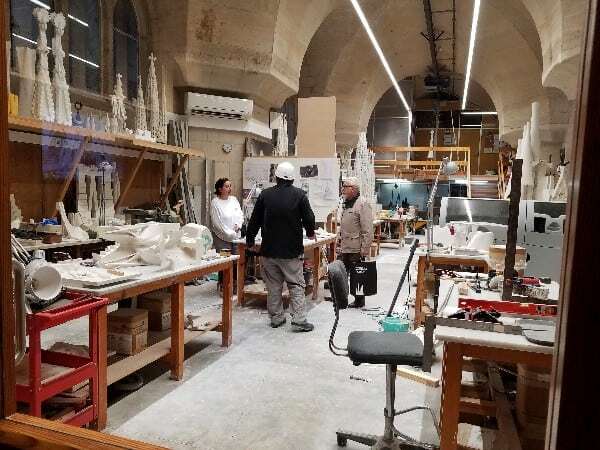 The Sagrada Familia is expected to be completed in 2026, which would mark the 100-year death anniversary of Antoni Gaudí. How far ahead can I buy tickets? About 2 months ahead of time. In the winter, it’s pretty easy to get tickets. You can probably get them the day of your visit. However, the last ones around 5 and 6pm (when the sun sets and the light comes through the colored glass) may be sold out weeks in advance. Can I buy tower tickets, or any additional services, when I’m inside? Yes, but they’re subject to availability. It might be possible in the winter, but they may be available at another hour. For example, let’s say you arrive at 10am, and decide to buy tower tickets. The next available time might be at 3pm. You’d have to stay there or for 4 hours, or attempt at buying another ticket! The smartest thing to do is to buy all the services (tower or guided tour, etc.) ahead of time all on one ticket. According to the official Sagrada Familia website, it’s shoes required, no see-through clothing, shoulders covered, modest neckline, no exposed backs or bellies, mid-thigh length skirt or shorts, no swimwear, and no special clothing to draw attention for artistic, religious, promotional or any other purposes. Decide in-depth how much of the Sagrada Familia you want to see. Do you want a tour guide? An audioguide? Buy your tickets ahead of time. Cheapest ticket: Via the official ticket website with no commission. Best value: guided tour with tower access. 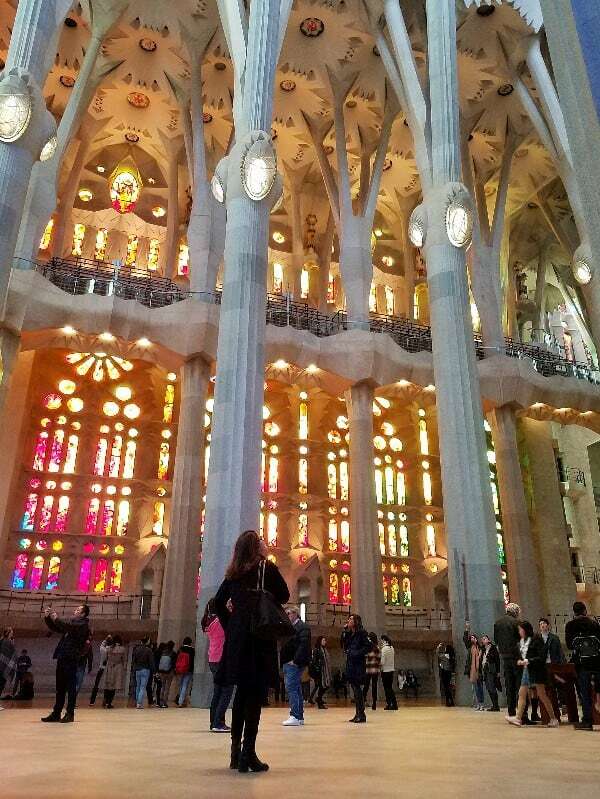 Best value if you’re seeing other sights like Park Guell, La Pedrera, and Casa Batlló: Sagrada Familia ticket included with Barcelona City Pass. BE SURE TO READ THE RULES ON YOUR TICKET CAREFULLY. Map out where you’re supposed to meet so you don’t arrive all discombobulated. Bring your camera / and your smartphone for photos. Day of: Bring extra headphones if you’re doing an audioguide. Bring water if you get thirsty. Dress respectfully. Give yourself some leeway when arriving: Try to be there at least 15 minutes ahead of time. You do NOT want to be late and miss your time slot! Enjoy your time learning about the Sagrada Familia! How to get there: Metro L2 and L5 Sagrada Familia stops. Bus 19, 33, 34, 43, 44, 50, 51, B20, and B24. 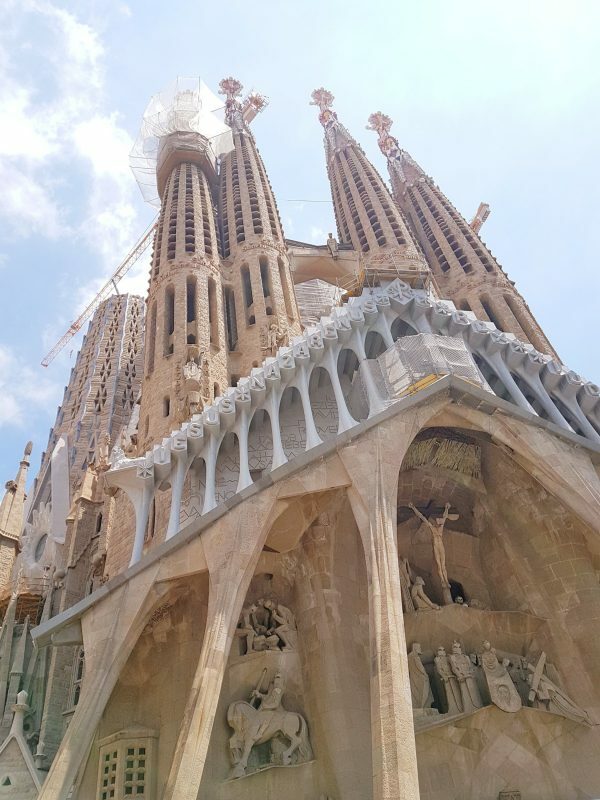 Have you been to the Basilica de la Sagrada Familia? What did you think? Anything else you want me to share?